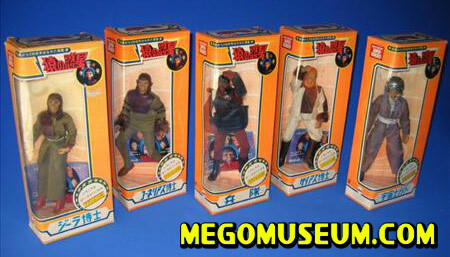 The human created for the first line of figures was not based on the Charlton Heston character of "Taylor. 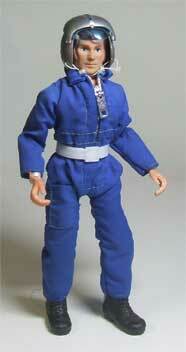 "Mego did not get the likeness rights to Heston with their deal. Even so, it is worth noting that the Montgomery Ward Christmas Catalog of 1974 mistakingly referred to the Astronaut figure as "Taylor." 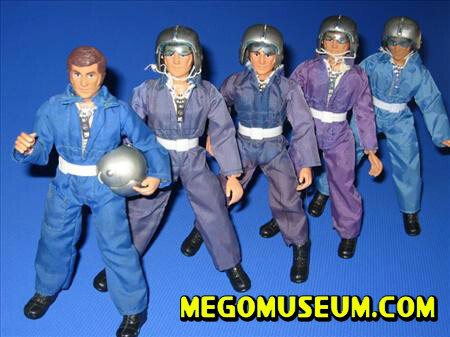 Rather than granting the character a personality, Mego simply named him the "Astronaut." This title was used with very amusing results in one Mego commercial, which began by showing a gorilla sniffing the air. "Hmmm," he grunts. "I smell an Astronaut!" The original Astronaut was dressed in a blue zippered flight suit, given an Air Force pilot's helmet, and short, "laced" black boots. To be complete, he also needs a white plastic belt. 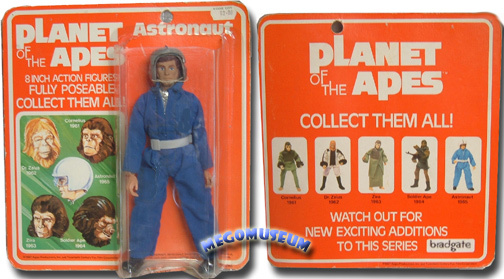 The astronaut was never sold with an elastic belt like the one worn by Action Jackson and as pictured in catalog shots. 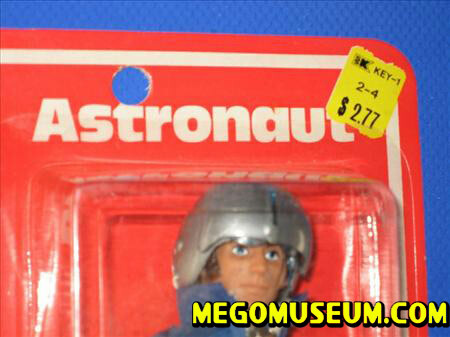 The Astronaut's head bears a 1972 copyright date and classic 1972 sideburns. It has been postulated that this head was originally sculpted to be Don, the male companion to Dinah-mite, but, for reasons unknown, the decision was made to use a Superman head instead. 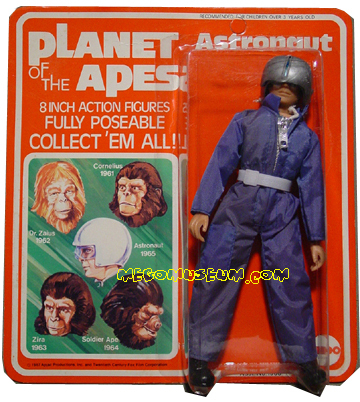 The astronaut is pictured on the box art of a Dinah-mite Pool set exclusive to Australia. The first austronaut released on the 1st issue cards have a suit made of a soft nylon which does not fade over time but remains a deep blue. Later issue figures have suits that turn grey, purple, or fade in sections only. He was released on a type1 body and for a very short time as on a type 2. His suit and belt were resized to fit the larger body. His hair color can vary in different shades of brown. Different types of fabric were used over the figures production period, combine that with the suit's tendency to grey over time and you get a few variations. Photo courtesy of Mike Jimenez. 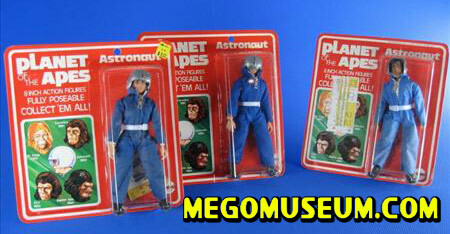 Carded Palitoy (Bradgate) Astronaut has a different backer than the US release. 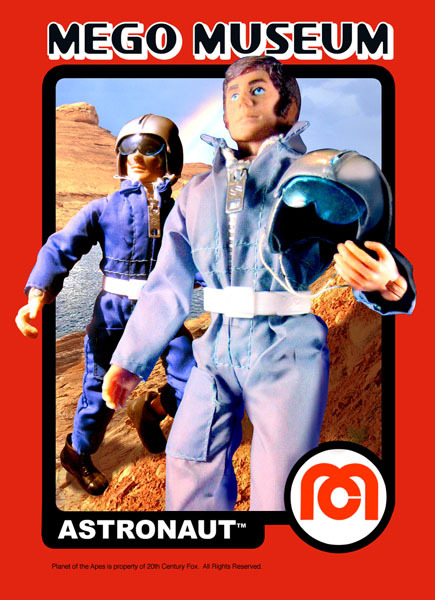 He is difficult to find on this card and was not released during the Palitoy second run.